Remember to enter the $25 Amazon Gift Card Rafflecopter Giveaway throughout the tour. 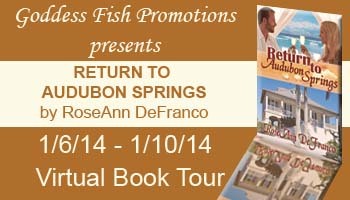 This entry was posted in Giveaway, Return to Audubon Springs, The Brothers of Audubon Springs and tagged BROTHERS OF AUDUBON SPRINGS, Giveaway, Goddess Fish Promotions, Return to Audubon Springs, RoseAnn DeFranco, Straight from the Library. Bookmark the permalink.